Erect perennial herb, 0.30-1m tall, native to Eurasia; inflorescences erect, axillary, clusters; flowers bright pink, pale in the centre, with darker pink (violet) lines like rays from the centre; petals 15-30mm , sepals 5-7mm long. The main acidic polysaccharide preparation isolated from the leaves of M.sylvestris L. var mauritiana Mill. is composed of l-rhamnose, d-galactose, d-galacturonic acid, and d-glucuronic acid in the molar ratio of 22:6:22:11, and contains 7.7% peptide. The substance showed considerable anticomplementary activity. The leaves of M.sylvestris contain 8-hydroxyflavonoid glucuronides like gossypetin 3-glucoside-8-glucuronide and hypolaetin 4′-methyl ether 8-glucuronide, hypolaetin 8-glucuronide and isoscutellarein 8-glucuronide. 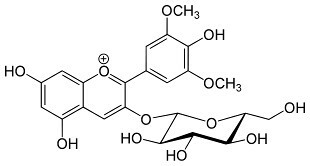 From the aqueous extract of M.sylvestris, eleven compounds were isolated: 4-hydroxybenzoic acid, 4-methoxybenzoic acid, 4-hydroxy-3-methoxybenzoic acid, 4-hydroxycinnamic acid, ferulic acid, methyl 2-hydroxydihydrocinnamate, scopoletin, N-trans-feruloyl tyramine, a sesquiterpene, (3R,7E)-3-hydroxy-5,7-megastigmadien-9-one, and (10E,15Z)-9,12,13-trihydroxyoctadeca-10,15-dienoic acid. M. sylvestris flower extract accelerated wound healing in rats. Extract-treated wounds showed increased well organized bands of collagen, more fibroblasts and few inflammatory cells. The extract effectively stimulated wound contraction as compared to control group and other groups. These findings support the plants traditional use.